Seguso arte Vetro, Murano, Venice, Italy. Two year apptrenticeship with Livio Seguso. Studied technique and theory in blown glass and solid form with maestro Livio Seguso. Completed extensive work in sculpture. Initiated freelance design commissions with Seguso Arte Vetro, Murano, Italy; La Morisa Vetreria, Mestre, Italy; Camer Glass, New York, New York. Created design series in production ware, table lamps and lighting fixtures. Alfred University, Alfred, New York. Teaching and Technical Assistant. Taught Hot Glass Class. Coordinated and supervised daily operation of Glass department. Maintained and repaired equipment. Prepared weekly glass supply from raw materials. Laurel Mountain Glass, Boswell, Pennsylvania. Owned and operated a handcraft production glass studio. Produced hand-blown glass for the craft market. Developed retail and wholesale sales outlets. Created and designed product line. Master of Art, 1988, New York University, New York, NY. Bachelor of Art, 1975, Goddard College, Plainfield, Vermont. Pilchuck Glass Center, 1979-80-81, Stanwood, Washington. 2001 Art Elements Gallery, Milwaukee, Wisconsin. 2000 The Glass Gallery, Bethesda, Maryland. 1997 Portia Gallery, Chicago, Illinois. 1994 Vespermann Gallery, Atlanta, Georgia. 1990, 91, 92 Christy/Taylor Gallery, Boca Raton, Florida. 1991 Kavesh Gallery, Sun Valley, Ketchum, Idaho. 2001 Morgan Glass Gallery, Pittsburgh, PA. "Beaux Objets." 1999-2000-2001 Holsten Gallery, Stockbridge, MA, Summer Group Show. 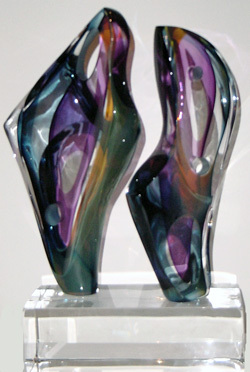 1999-2001 "Hot and Cool - Contemporary Glass Works." Touring Exhibit - Midwest States by Exhibits U.S.A., Mid-America Arts Alliance. 1997 The Morris Museum, Monistown, NJ, New Jersey Arts Annual: Crafts. 1995 Grohe Gallery, Boston, MA, "Bare Essentials." 1994 The Gallery at Wheaton Village, Millville, NJ, "Glass Analogies." 1993 Glass Midwest "93", Bowling Green State University, Bowling Green, OH. 1992 The International Exhibition of Glass Kanazawa "92," Kanazawa, Japan. 1990 Kanazawa Competition "90", The International Exhibition of Glass, Kanazawa, Japan. 1989 The Newark Museum, Newark, NJ, New Jersey Arts Annual. 1988-89 Spaso House, American Embassy, Moscow, Russia, Loan Exhibition from the Twentieth Century Collection, Coming Museum of Glass. 1988 80 Washington Square East Galleries, New York, NY. 1985 Universitario di Architettura de Venezia, Venice, Italy. New York University Group Show. 1984 Querini Stampaglia Gallery. Venice, Italy. New York University Group Show. 1983 Southern Alleghenies Museum of Art, Loretto, PA.
1982 Traver-Sutton Gallery, Seattle, WA, Pilchuck Artists. 1980 M.C.C.N. Marietta College Crafts National, Marietta, OH. 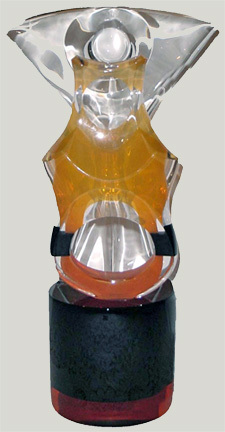 American Style, Summer, 2001, "Conducting a Symphony in Glass." American Style, Spring 2001, "Centered on Art." Glass An from Urban Glass. edited by Richard Yelle, Schiffer Publishing, Atglen, Pennsylvania, 2000. Who’s Who of American Women. 1999-2000, Marquis Who’s Who, New Providence, New Jersey. New Glass Review 19. 1998, Corning Museum of Glass, Coming, New York. New Jersey Country Roads. Autumn, 1998 "Glassmaking’s Glittering Heritage." Washington Post. March 13, 1997, Washington Home, "Datebook." Columbus Guardian. June 9, 1993, "Artist Profile." WOSU - Channel 34. "D’Art" April 13, 1993. Artists in Glass, Columbus, Ohio. New York Times. August 5, 1990. Review "Show by Fellowship Winners." Matter. May, 1990 ‘The Glass Struggle." New York Times. November 26, 1989. Review "Diversity of Works in Clay and Glass." Art Today. Spring 1989, "American Craft at the Annory." ARTS/NEW JERSEY. Autumn 1989, New Jersey State Council on the Arts, Trenton, New Jersey. New Glass Review 4. 1983, Coming Museum of Glass, Coming, New York. Washington Metropolitan Glass Club, College Park, Maryland. March, 1997. Columbus College of Art and Design, Columbus, Ohio, April, 1994. Guest Artist, Artpark, Lewiston, New York, Summers, 1992, 1994. Visiting Artist, Tyler School of Art, Philadelphia, Pennsylvania. Fall Semester, 1993. Visiting Artist, Ohio State University. Columbus, Ohio, May, 1992. Artist-in-Residence, Golden Glass Studio and School, Cincinnati, Ohio, 1991-1992. 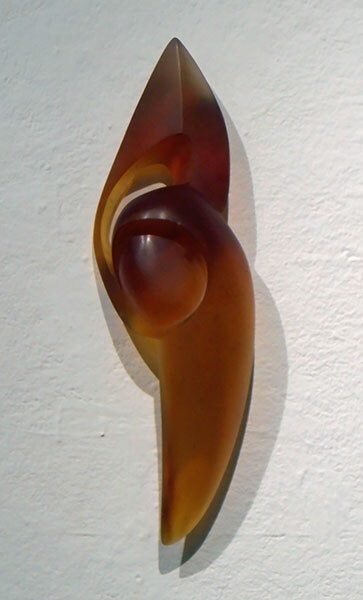 Fellowship, Three Month Residency, Creative Glass Center of America, Millville, New Jersey, 1996. Visual Artist Fellowship Grant, New Jersey State Council on the Arts, 1989-1990. 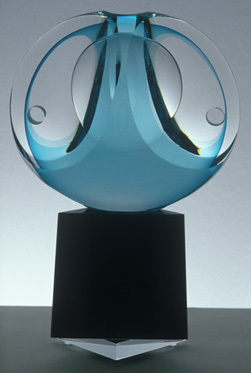 Finalist, Niche Awards, A Celebration of Excellence in American Craft. Niche Magazine, 1990. Fellowship, Five Month Residency. Creative Glass Center of America, Millville, New Jersey, 1988. Coming Museum of Glass, Coming, New York. Tropicana Products Inc., Bradenton, florida. Centeon Pharmaceutical, King of Prussia, Pennsylvania. Conrad and Rosemary Arnolts - Centerpiece for dining room, Annandale, Virginia, 2002. 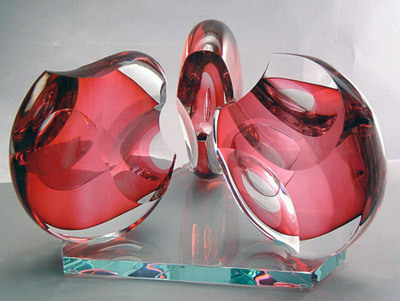 American Art Award, Whitney Museum of An, New York, New York, Crystal Components for Sculpture Designed by Tom Ottemess, 1998. Apollo Theatre Foundation, "Up in Lights", Limited Edition Commemorative Awards, New York, New York. 1997. Artpark Award, Sculpture presented to Harry Belafonte by Artpark, Lewiston, New York, New York State Council of the Arts and Mario Cuomo, Governor, New York State, in recognition of lifetime artistic and human rights achievement. 1993. Middlesex County Cultural and Heritage Commission, North Brunswick, New Jersey, Arts in Achievement Awards. 1990-1994.